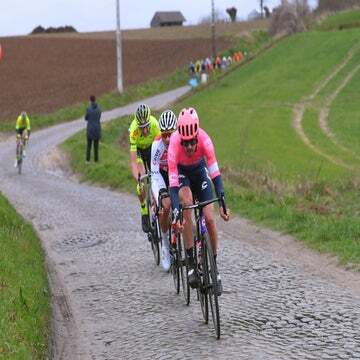 This weekend sees the opening of the classics season, the races where man (and woman) and machine smash into stone and wind. Into the cold of northern Europe. The season’s races are for hard men, and we love them because in a sport rife with control and managed outputs, the classics represent chaos; the weather can dip below freezing. Snow can cancel a race. The strongest man can outright ride away from a pack of chasers over the stones, his pursuers doomed to an ungraceful struggle. Omloop Het Nieuwsblad (Circuit Het Nieuwsblad) is Saturday. The high temperature will be 37 F, or thereabouts, with a low of 28. It’s warmer than that on the peaks of the cols at night in July at the Tour de France, generally. Snow has fallen three times on the eve of the race formerly known as Omloop Het Volk — in 1955, 1974, and 1988 — though those editions still went on. The race was postponed in 1971 due to weather, and canceled outright in 1986 and 2004 due to weather. Historically, Belgians dominate the Omloop. There must be something of a home-climate advantage. On Sunday, it’s Kuurne-Brussel-Kuurne, which sees a similar forecast to that of the Omloop: highs in the 30s, and cloudy. The race (65 versions old) has been canceled twice due to weather, and organizers shortened it in 2010 due to extreme weather from a cyclone. That year, the race lost 20 kilometers at the end because of a fallen tree, and only 26 riders were able to reach the finish. The things bike riders do for fun. Or for money. And though we think of the spring classics as all-out sufferfests in weather fit for drinking cider on the couch, it’s not often these races stick out to us for their severe weather more so than some that come later in the season. And so, in honor of the season and the return to racing, we asked some VeloNews contributors and editors which races they recalled for horrendous weather conditions and heroic rides. The answers ranged from all of the Vuelta al País Vasco (Tour of the Basque Country) to Dominique Rollin’s stage 4 win at the Amgen Tour of California. Below are some of those answers. After all, it is the season. 1980 Liège–Bastogne–Liège: Bernard Hinault won by more than nine minutes in the snow at “La Doyenne.” The weather was dreadful, and journalists pegged it as the worst-ever at the time in the history of the oldest classic. No edition has displaced it since. After just an hour of racing, half the field had abandoned, and it became a matter of survival for those left. Hinault worked to close a gap to a two-man break as he increased the pace on the Col du Stockeu climb. With a frozen, snowy 80km to go, “the Badger” rode past the two riders and soloed home to the finish. He won by nearly 10 minutes, claiming the race for a second time. Of the 174 starters that day, only 21 finished. 1988 Giro d’Italia: Andy Hampsten on the Gavia, in a blizzard. This is one of those where there isn’t really anything more to say other than, “look at the picture.” You know the one: Hampsten, barelegged with big, yellow lenses protecting his eyes, riding open-mouthed over the snow. Hampsten won the pink jersey that year, but finished second on the epic stage over the Passo Gavia, in which he attacked in a spectacular blizzard. The limited number of images in existence from this day are truly surreal and make nearly ever other bike race look like a day on a white sandy beach. Truly epic. 2001 Paris-Roubaix: Servais Knaven won in the ridiculous mud. This is the photo that’s worth 1,000 words. Knaven is there, in the front, his face a mess of mud and grit. But his eyes — those clear eyes — just stare straight out, through the muck and into the distance. The Dutch rider launched an attack with 10km left and crossed the finish line by himself. Another hardman fact: He’s one of only two riders to ever start and finish the “Hell of the North” 16 times. 2010 Giro d’Italia: Cadel Evans (BMC Racing) versus Alexandre Vinokourov (Astana) in the Siena mud. Evans won stage 7 in the rainbow bands of the world champion, and Vinokourov took back the leader’s jersey. The hilly finale took in two 10km stretches of strade bianche, the ordinarily dusty white dirt roads made famous by the Montepaschi Eroica race. On this day, they were slick and slippery, thanks to a spring rain. Amgen Tour of California riders gathered around laptop computers in Sacramento to watch the drama unfold as Ivan Basso and Vincenzo Nibali were among the riders to crash and lose time. The second sector was almost entirely uphill and ended only 4.4km from the finish in Montalcino. A landslide also altered the day’s course. Of course it did. 2012 Olympic Road Race: Marianne Vos took gold in the rain. This wasn’t selected because it was the most recent, though the retina-searing picture of a sopping-wet Vos screaming into the rain after the win was one of last season’s best images. The fight for medals came down to a break of Vos, Russia’s Olga Zabelinskaya, Great Britain’s Lizzie Armitstead, and American Shelley Olds. Olds flatted, leaving the three women riding for gold. Vos knew Armitstead was probably faster to the line, so she launched in the rain with 200 meters to go, and took gold amid the storm.